Reshape your image with SlimEFX! SlimEFX with Hoodia is one of the best natural weight loss remedies that will help you lose weight fast and easy. This safe & most effective diet pill accomplishes its objectives by simply suppressing the appetite, cutting the fat & carbohydrates intake, reduce the fat production, and encourage fat loss. These quick & best proven weight loss pills feature potent vitamins and best herbal appetite suppressants. SlimEFX will help maintain physical energy, increase lean muscle, stimulate metabolism, while detoxifying the body system. Our non prescription diet pills contains quality vitamins & herbs without caffeine, and stimulants. Do not waste your money on any other herbal weight loss supplements that just have minimal effectiveness. SlimEFX with Hoodia weight loss pill is guaranteed to help you lose weight fast easy or you get your money back! "62% of Americans are Overweight"
Recommended Use: As a dietary supplement for adults. Take one to two capsules approximately 1/2 hour before each meal with a large glass of water. A diet pill that works with best herbal appetite suppressants! What's So Good About SlimEFX? SlimEFX with Hoodia is the only effective Triple Action Formula in the market! This safe diet pill will help loose weight fast & offer an effective viable herbal solutions for a healthy weight loss program. Suppress Appetite. Hunger is the number one enemy of every diet plan. 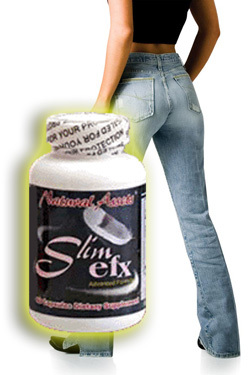 SlimEFX contains potent natural appetite suppressants so that you simply eat less. Accelerate Metabolic Activities. Increase metabolism to help loose weight with thermogenic effect. Burn unwanted fat. You simply beat the hunger, burn more, and lose weight fast & easy naturally! Best Proven Weight Lost Pills! But there are more.....All of our vitamins and natural ingredients are top quality, and certified by our laboratory for safety and potency. Furthermore, all the herbs in our products are going through a special extraction manufacturing process to deliver at least 4 to 20 times higher potency than ordinary herbs' normal strength. In addition, some of our ingredients are further processed to contain the only standardized ACTIVE nutrient that makes the herb more powerful. Garcinia Cambogia is an example of a potent standardized herb that contains a minimum of 50% Hydroxycitric Acid, the active nutrient that gives Garcinia its great effectiveness as one of the best natural appetite suppressants. Get your Hoodia Weight Loss Diet Pill Risk Free! Powerful & synergistic blend of 10 well-researched and potent weight loss herbs (7), natural nutrients (1), and vitamins/amino acids (2). Weight gain happens by over eating while weight loss happened by under-eating and when caloric intakes do not exceed caloric needs. Hunger is the major problem of any diet. Hoodia Gordonii. The Council for Scientific and Industrial Research (CSIR) in South Africa isolated an active & best appetite suppressant compound called P57 from Hoodia gordonii. The P57 molecule contained only in Hoodia works by replicating the effect glucose has on nerve cells in the brain so the body believes and feels full even when it is not. The Hypothyalamus receives this signal as an indication that enough food has been consumed and this, in turn, reduces the appetite naturally. During clinical trials of the pure dried Hoodia gordonii powder, it was discovered that the P57 molecule could naturally reduce the appetite by up to 2,000 calories a day. Garcinia Cambogia, a fruit native to India & Southeast Asia, is rich in (-)hydroxycitric acid (HCA), an extracted active compound from the fruit grind of Garcinia that is popular as an herbal appetite suppressant. Hydroxycitric acid helps balance blood sugar level, nourish the brain to helps reduce the desire to eat high-calorie foods in addition to reducing the conversion of carbohydrates into stored fat by inhibiting certain enzyme processes. Vanadium is also a naturally occurring best appetite suppressant. It also assists the metabolism in converting carbohydrates into energy (University of British Columbia, Vancouver, Canada). Gymnema Sylvestre is an herb suggested to interfere with the ability to taste sweetness, which lends it to weight management application that could reduce sweet intake. Gymnema has been shown to raise insulin levels in healthy subjects, and it has been noted to reduce intestinal glucose uptake. Gymnema has been used effectively in many quick weight loss programs. Get the Most Effective Diet Pill Risk Free! Chitosan is made of Chitin, a common natural fiber derived from the shells of marine animals such as shellfish. Chitosan consumption is most notable as a fastest weight loss diet but has also demonstrated the ability to control blood pressure, lower cholesterol and may act as an antacid. Chitosan has the unique ability to dissolve and trap fats in the form of cholesterol and triglycerides in the stomach. The fat trapped in Chitosan is expelled through solid waste. A 1994 double-blind study (Helsinki) showed that the average weight-loss for the Chitosan group was fifteen pounds in four weeks. Chitosan side effects are reported to be minimal. Results from the 14 randomized controlled trials on Chitosan supplement founded that people taking the supplement had an average weight loss four pounds more than those on placebo in the short term. Buy Your Diet Pill Online That Works Risk Free! During the digestive process, the body converts carbohydrates, found in starchy foods such as potatoes, pasta, potatoes, breads, pasta. rice, corn and crackers into sugar calories. These sugar calories are either burned off, through active exercise, or stored as fat cells for future use. Unfortunately, inactivity means that these stored fat cells accumulate into weight gain. A recent clinical study investigated the effects of white kidney bean or placebo in 50 obese adults for eight weeks. Researchers say a greater weight loss in the group receiving white kidney bean compare to the placebo group. Carb blocker should be a part of any quick weight loss plan. Nopal has fat binding effectiveness. In a clinical study of 10 volunteers, the quantity of fat content excreted versus the quantity ingested increased by 27% in the treatment group compared to the placebo group. An earlier study investigation the mechanism of action in a gastrointestinal (GI) model found Nopal prevented the absorption of fatty acids during a four-hour GI exposure. Similar to carb blocker, fat binding characteristic should belong to any effective natural weight loss remedies. Green Tea, a best thermogenic supplement, contains potent polyphenol catechins antioxidants, theanine, caffeine. Several studies have indicated that green tea extract increases thermognenesis that burns calories and fat more efficiently. A compound in green tea weight loss called epigallocatechin gallate (EGCG) has been shown to significantly reduce food intake and, subsequently, body weight in healthy adults. Japanese researchers found that when using Green Tea in a healthy & best weight loss plan, the caffeine and theanine helped lose weight naturally. German researchers have found EGCG enhances thermogenic quick weight loss, promotes fat oxidation, and help loose fat fast. It's considered one of the best diet foods. Cocoa Extract contains theobromine, a chocolate's caffeine cousin that has high antioxidant properties. It's a natural appetite suppressant and has mild diuretic similar to caffeine but does not stimulate the central nervous system as strongly as caffeine. Any best proven weight loss diet pills should utilize cocoa in its formulation to help you lose weight fast easy. Order your SlimEFX Without Risk Today! SlimEFX Herbal Weight Loss Supplement is Guaranteed to Work! Water help to loss weight. By drinking water in large amounts daily, a water fast would probably result in an average of 1 to 2 pounds per day of weight loss. This same water fasting weight loss also helps to promote healthy digestive activities and reduce constipation. Walking for weight loss for at least 30 minutes per day. It's one of the best & free weight loss option. Do not skip meals. However, eat more healthy and nutritious food (fruits, vegetable) & avoid carbohydrates. Eat meals regularly but reduce the normal lunch or dinner portion to about 1/3. Do not eat dinner or snack after 8 PM. SlimEFX with Hoodia, a best weight loss vitamin product with best appetite suppressant, offers top quality standardized and concentrated extracts of natural herbs for safe, and healthy diet. We want to ensure that consumers receive consistent and potent benefits from the hers' active compounds while retaining all the tradition whole-part characteristics from other complementary herbs to help you lose weight fast easy. "Hello Harrison, SlimEFX was great. It does exactly what it's supposed to do. A friend of mine has lost 8 pounds in two weeks. She has tried many diets before this. She will continue to maintain a healthy diet and exercise. Same results for others too." "SlimEFX helps me curb my uncontrollable appetite. I have lost so far 9 pounds. Great diet pill, I would recommend it."